Why Do Autistic Children Play Differently? If your autistic child can't or won't play typical childhood games, she's not alone. Few autistic children play "like the other kids," and many engage in activities that look nothing like ordinary play. That can make things difficult for parents as they try to find playdates and activities for their children. It can even be hard to figure out just how to play with your own child. Kids with autism play differently from other kids. Even at a very young age, autistic kids are more likely than their typical peers to line objects up, play by themselves, and repeat the same actions over and over again. They're also less likely to engage in games that require "make-believe," collaboration, or social communication. Of course, many children without autism line up objects, play alone or choose other activities over make-believe. But while children with autism are apparently unaware of others' activities and preferences, typical children imitate their peers to learn new play skills, collaborate with others, and ask questions when they're confused. Typical children who play alone generally do so for a reason, and are capable of joining in when they're ready or encouraged to do so. If your child seems unaware of other children or appears to be unable to learn new play skills through observation, social engagement, or verbal communication, you might be looking at a red flag for autism. While it is typical for toddlers to engage in solitary play from time to time, most graduate quickly to "parallel" play during which more than one child is engaged in the same activity at the same time (two children coloring in the same coloring book, for example). By the time they are two or three, most children are playing together, sharing an activity or interacting in order to achieve a goal. Become so rule-bound that they are unable to cope with necessary changes to the number of players, size of playing field, etc. Why Is Play So Tough for Children with Autism? Lack of imitation skills. 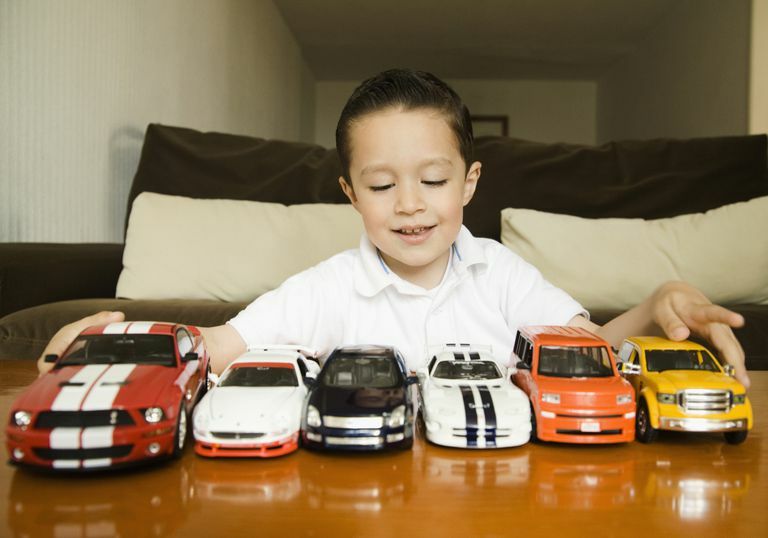 Typically-developing children watch how others play with toys and imitate them. For example, a typically-developing child might choose to line up blocks one next to the other the first time they play with them. But as soon as the typically developing child sees others build with the blocks, he will imitate that behavior. A child with autism may not even notice that others are playing with blocks at all and is very unlikely to observe others' behavior and then intuitively begin to imitate that behavior. Lack of symbolic play skills. Symbolic play is just another term for pretend play, and by the age of three, most children have developed fairly sophisticated tools for engaging in symbolic play both alone and with others. They may use toys exactly as they're designed—playing "house" with a pretend kitchen and eating plastic food. Or they may make up their own creative pretend play, turning a box into a fortress or a stuffed animal into a talking playmate. Children with autism rarely develop symbolic play skills without help. They may enjoy placing engines on a track, but they're unlikely to enact scenes, make sound effects, or otherwise pretend with their toy trains unless they are actively taught and encouraged to do so. Even when they do engage in symbolic play, they may repeat the same scenarios over and over again using the same words and even the same tone of voice. Lack of social communication skills. In order to be successful in pretend play and imitation, typically developing children actively seek out engagement and communication, and quickly learn how to "read" the intentions of other people. Children with autism tend to be self-absorbed, and have little desire or ability to communicate or engage with playmates. Peers may see this behavior as hurtful ("he's ignoring me! "), or may simply ignore the autistic child. In some cases, autistic children are bullied, scorned, or ostracized. Lack of joint attention skills. Joint attention skills are the skills we use when we attend to something with another person. We use joint attention skills when we share a game together, look at a puzzle together, or otherwise think and work in a pair or group. People with autism often have impaired joint attention skills. While these skills can be taught, they may never develop on their own. All of these techniques can be applied by parents, therapists, or teachers, and all have the potential to be helpful. None, however, comes with any kind of guarantee; while some children with autism do develop solid play skills others find the challenge too great. For most parents, the best way to get started is with the involvement and help of a trained therapist who can provide coaching and support. LC Murdock. Picture me playing: increasing pretend play dialogue of children with autism spectrum disorders. J Autism Dev Disord. 2013 Sep 25. LC Murdock. Teaching reciprocal imitation skills to young children with autism using a naturalistic behavioral approach: effects on language, pretend play, and joint attention. J Autism Dev Disord. 2016 May;36(4):487-505. MM Manning. "The role of high-level play as a predictor social functioning in autism." J Autism Dev Disord. 2010 May;40(5):523-33.